Does the lack of practice time really matter? It can go both ways. 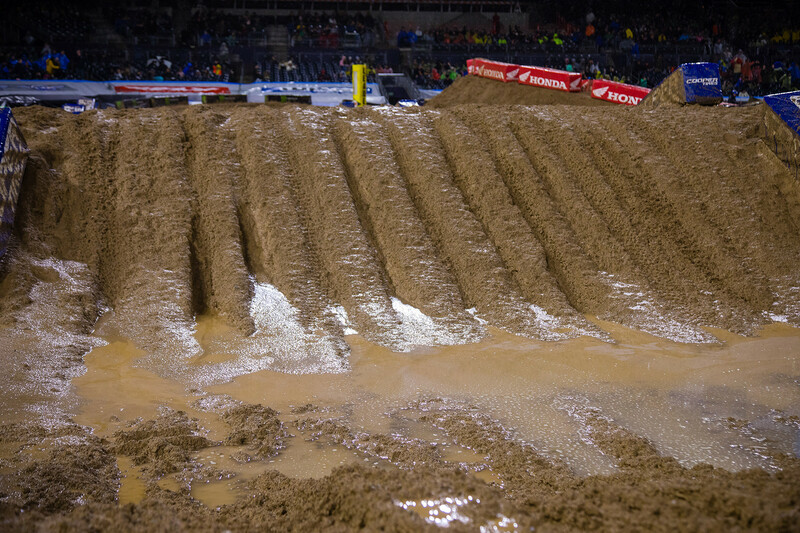 In a situation like Saturday night, it wouldn't really matter for most because the track is so muddy. The riders aren't jumping big combinations or searching for the fastest lines. The mud eliminates all of that and makes it much more about avoiding the crash or mechanical failure that can ruin a race. If the rain doesn’t come, though, and riders get a decent racetrack, it definitely matters. The riders that can mentally sort through the different track options quickly will have the advantage. There is less video to study and the track just hasn’t been worked in quite yet. The elite riders might be able to still put a big rhythm together during the main event that the one practice didn’t allow. James Stewart was great at this. When there is less data and video to draw from, the more adaptable riders tend to succeed. How crazy is it to be doubling and even tripling in these conditions? It’s impressive, no doubt. Every time a rider commits to a triple in sloppy mud, there is always that moment of truth where full trust is put in the tires to stick during hard acceleration. If the rider spins or cross ruts after he is committed, bad things are almost always going to happen. It’s risk/reward but if you can put together even the most basic of double jumps, the finish line jump, and throw in a triple, you can gain multiple seconds per lap on your rivals. To an outsider, it would seem dumb to run anything but roll-offs in these conditions. But some riders prefer tears-offs. Why? I believe some of it is generational and some is preference. The older generation was dependent on roll-offs because laminated tear-offs didn’t exist. With a maximum of four to five tear-offs possible before vision became distorted, the only realistic option was roll-offs. It wasn’t even a question or given a second thought. Nowadays, with the possibility of running up to 28 laminated tear-offs for most (it gets blurry past that), riders who aren’t comfortable with roll-offs’ narrow vision window or don’t like the added weight to the goggle, or worry about water getting behind the roll-off stream (most common issue), there is a secondary option. I still think roll-offs are the most reliable option (with a couple of tear-offs on top of that for the first turn). It was just a mud race, but is Justin Bogle turning things around? It would certainly appear so. The mud is not really the greatest indicator of momentum, but his Oakland ride was much better, too. The biggest factor is his incredibly good starts, but he is building from them and making headway during the actual racing as well. His speed looks close to where it needs to be and if he can continue to stay healthy, the fitness will show up sooner or later. Progress snowballs, creating confidence most importantly of all. If he can continue to grab holeshots, he is going to be hanging around the top five consistently by season’s end. Anything to worry about for Cooper Webb? Not in the least. Sure, he lost points which isn’t helpful, but I thought he rode well minus the crashing. He was great in timed qualifying and proved that none of this is a fluke. If he wins this title, he will have to beat the best of the best straight up but as far as being concerned with a bad night in the mud, I am nowhere near that. He has more wins than anyone else and looks confident. Adam Cianciarulo avoided the big mistake under pressure last week, and in the mud this week. Has he finally turned the corner? I am week-to-week with Adam but yes, I am hoping this is a break through. He is the fastest rider in this class (arguably with Dylan Ferrandis) but has always shown a tendency to make inopportune mistakes. If he didn’t melt down at A1 and then toss away another sure win in the first main at A2, this title would look much differently than it does. He would have a nice points lead and be the easy favorite to win this title. Unfortunately, all of those things did happen, and he is in a dogfight. Last night was a huge step forward towards accomplishing his main goal but he is going to need to avoid the mistakes down the stretch. This series is too short to give away big points on any given night. I think the most critical moments will be in the East/West races where more point separation might happen.